The 4th of July is a holiday that is actually very near and dear to my heart, not only because it celebrates our Nation’s independence, but also because I have such treasured memories from this holiday. As a kid my parents would always take us to a little town named SpringerVille. I love the 4th of July’s here! We actually still go every year, and not a whole lot has changed since I was a kid. They still have a parade that goes down the same streets. Followed by a small rodeo, where we always get cherry snow cones. The whole environment is just down home goodness! Not to mention, my family is kind of the trouble makers of everything. So we get to have our fun, and then go home, not worried about seeing these people on a daily basis 🙂 Actually one year when I was about 13 we brought these huge super soakers to the parade and soaked everyone! People riding on floats. People in cars with their windows down. It was bad!! Super funny! But from that point on water guns have been banned from the parade :/ Last year there was a bunch of scout kids selling marshmallow guns trying to rase some money. I knew we were in trouble when my mom bought 4 of them. Or was it 6? All I know is they were meant for the kids, but it didn’t take long for the adults in my family to confiscate them for their own enjoyment. These guns are basically a blow gun, except instead of shooting a dart, you blow out marshmallows. We were there for over an hour after the parade was over trying to shoot marshmallows into open windows of the cars driving by. Good times 🙂 We will be heading up for sure this year as well, and luckily my mom has kept the marshmallow guns!! Long story short, this is one of my favorite holidays. So when I saw these cupcakes I thought, “Yes!! Prefect!” So cute! So patriotic!! The recipe is pretty straight forward. It’s just a yellow cupcake with buttercream frosting. Nothing really original or different about them. I was thinking that a filling would be good, but for now we’ll just keep the cupcake part of these simple since the decorations are more demanding. Also, if you don’t want to make yellow cupcakes from scratch, then just substitute for a box. I made the red chocolate star on top using a chocolate star mold I found from Joann’s for $2. Then I just got the red melting chocolate wafers and piped it inside the mold. If you want an example you can click here to view how I did this on another recipe. Enjoy!! Heat oven to 350 degrees. Place paper baking cup in each of 18 regular-size muffin cups and mini paper baking cup in each of 18 mini muffin cups. In medium bowl, mix flour, baking powder and salt; set aside. In large bowl, beat butter with electric mixer on medium speed 30 seconds. Gradually add sugar, about 1/4 cup at a time, beating well after each addition and scraping bowl occasionally. Beat 2 minutes longer. Add eggs, one at a time, beating well after each additions. Beat in vanilla. On low speed, alternately add flour mixture, about 1/3 of mixture at a time, and milk about 1/2 at a time, beating just until blended. Divide batter evenly among muffin cups, filling each about 2/3 full. Bake regular cupcakes 18 to 25 minutes, mini cupcakes 12 to 20 minutes, or until toothpick inserted in center of cupcake comes out clean. Cool 5 minutes; remove from pans; place on cooling racks to cool. Meanwhile, make Vanilla Buttercream Frosting. 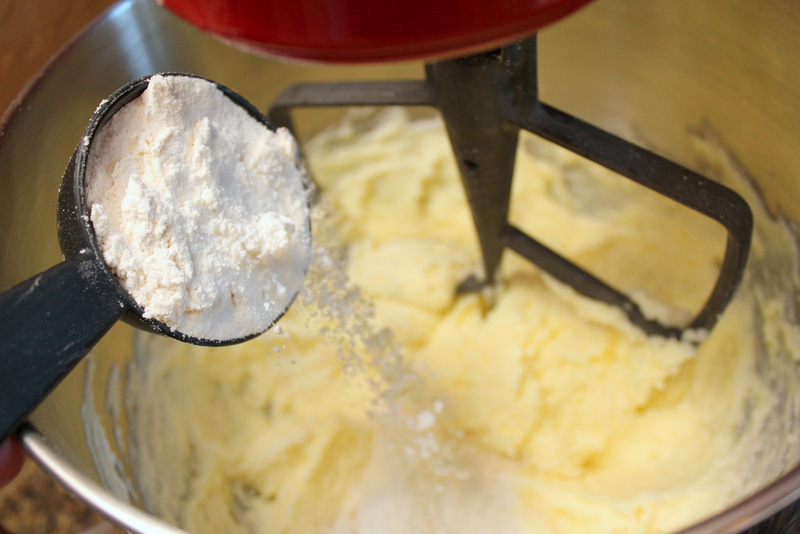 In large bowl, mix powdered sugar and butter with spoon or electric mixer on low speed. Stir in vanilla and 3 tablespoons of the milk. Gradually beat in just enough remaining milk to make frosting smooth and spreadable. If frosting is too thick, beat in more milk, a few drops at a time. If frosting becomes too thin, beat in a small amount of powdered sugar. Place 1 1/2 cups frosting in decorating bag fitted with small round tip (#22). Frost each cupcake (regular and mini) with scant tablespoon frosting, making various length streamers. Divide remaining frosting between two bowls; tint frosting in one bowl red and the other blue (To avoid icing from becoming more runny use gel food coloring, also called icing colors. You can get them at any craft store). Remove paper liners from mini cupcakes, if desired. Place 1 mini cupcake on top of each regular cupcake. Pipe blue and red frostings around base of mini cupcakes (on regular cupcakes) and on top of mini cupcakes, making various length streamers. Use any remaining white frosting to fill in streamers between red and blue ones. Decorate with candy decors, as desired.